I have worked for many years in various capacities both in the federal, state and local governments as well as in the private sector. Now retired, I can reflect on my procurement experiences with some degree of latitude not offered while one is still employed and must be careful what they say. Both the private sector and the public sector want the same things with a procurement – high quality services, timeliness and low costs. However, the approaches vary widely. In the private sector as a CEO or CFO I would often seek out an industry leader, many times one I had worked with in the past. Instead of spending time looking around, I would go to someone I knew would do the job right and with whom I had a relationship. If I could get a good price I would stop looking. If their price seemed high, I would ask around. Often, I would end back up in the first place, having found their price was not so high after all. Jumping vendors once in awhile kept your friends “honest” on their prices. They want to make a profit just like you, but if you allow them to be complacent, or don’t occasionally look around, the quality and timeliness can drop and the price can go higher. You don’t want to be taken for granted, especially if you are a small client for them. On the other hand, constantly jumping around establishes no relationships, and if it ain’t broken why fix it. Lasting vendor relationships over ten to twenty years can build real trust and respect. Resolving complex issues becomes a single phone call and a handshake. Each party trusts the other to do right by them. In the private sector this leads to a lot of doing business with people you know, or with those your friends know. It is harder to “break-in” to an established industry unless price is the only driver. In the public sector, this way of doing business is not only not accepted, but sometimes a crime. The public sector often assumes that all procurement bodies are corrupt and can be bribed by a meal at a nice restaurant or a sporting event. At my consulting firm, I spent over $10,000 per year on meals and entertainment with clients. It was how you got to know each other. It was considered “bad form” to bring up anything business related. It was about establishing relationships and trust, not about sales. In the public sector, that same behavior is viewed as trying to influence future contracts. Starting with that premise, procurement laws are set up to provide statutes and rules that eliminate the ability of anyone to be corrupt. This is of course impossible. People cannot accept gifts, they cannot discuss contract needs unless every submits questions and everyone gets the same answers, they have to do formal bid processes, set up panels, involve people who are impartial (which often means they know nothing of the project). Staying with the same vendor is often viewed as corruption. “This vendor has won every bid for ten years in a row!” Is viewed as some sort of empirical proof that there is corruption, not that the firm could be the best and lowest priced. The procurement code can even pre-set criteria such as cost, quality, and other measures in formats that don’t fit well with the project. A colleague in private sector big constructions, stadiums, civic centers, etc. told me that their company would lose money on every bid. They make all their profits off change orders and overrides because the procurement folks did not anticipate issues. So, they go for low price, then get a 50% overrun to do the job right. They told me it was industry practice. When I was CFO for a major state agency, we had a line item appropriation for $1.9 million. No matter who bid, they bid within $100,000 of that amount. Why? That is the amount we had. I could have bid for them to write one letter for me, or to work for an entire year with five people – $1.9 million would be the bid. I am not suggesting that nepotism, fraud, corruption or other bad behavior be tolerated, quite the opposite. I am just pointing out that the very laws intended to get good pricing often lead to substandard services and higher pricing. What to Do? First, if you are in any sector, think about the types of procurement available to you – project management bid, single source, emergency bid, multiple RFP, RFI, what tools will work best for your project. Then, bring in an expert with a history of skill in both following ALL the laws, AND with getting good vendors and pricing. These are rare individuals indeed. Arizona Rural Schools Association Conference that Bill Munch provided training. 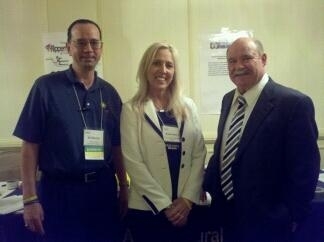 From the left, Bill Munch, Superintendent for Palo Verde, Robin Berry and Executive Director, Bill Blong. An Example – Recently, the Valley Schools Management Group (VSMG) a group purchasing organization serving the public sector, hired Bill Munch to work on procurement issues. The amazing thing here, is that VSMG did not just hire Bill Munch to help their organization. They hired him to help all of their member organizations as well – for free! Talk about going the extra mile. In addition, they are even offering his services to NON-members. Already, Bill Munch has helped with training at Tolleson Union School District, Tuba City Unified School District, Santa Cruz Valley Union High School District, Wickenburg Unified School District and Scottsdale Unified School District. Only two of those are VSMG members. Over the next few months, Bill has another twelve seminars and trainings planned across Arizona. When you see an organization that committed to helping others follow the procurement laws and save public funding, you just have to say Bravo! Many of those districts do not have the resources for that level of assistance on their own, and VSMG is there to help. I know of someone who just lost their public sector procurement job . . . . not sure why, but I do know it must have been something pretty bad . . . it was the person who got us the contract with a vendor who is AWFUL!